Previously posted in a slightly different form on NJWV. 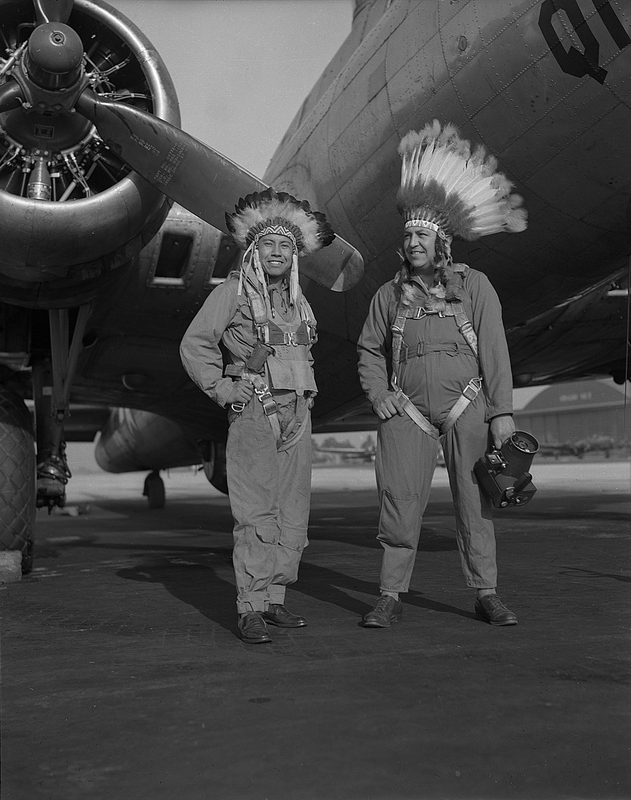 Gus Palmer (Kiowa, at left), side gunner, and Horace Poolaw (Kiowa), aerial photographer, in front of a B-17 Flying Fortress. MacDill Field, Tampa, Florida, ca. 1944. Robert “Corky” and Linda Poolaw (Kiowa/Delaware), dressed up and posed for the photo by their father, Horace. Anadarko, Oklahoma, ca. 1947. “Sindy Libby Keahbone (Kiowa) and Hannah Keahbone (Kiowa),” Oklahoma City, Oklahoma, 1930. The American Indian Exposition parade. Anadarko, Oklahoma, 1941. Since the National Museum of the American Indian has the best food of the Smithsonian institutions, it’s easy to find an excuse to visit it should I be museuming on The Mall. And once I’m inside it’s easy to stay and wander around. This time I checked out the Horace Poolaw show. 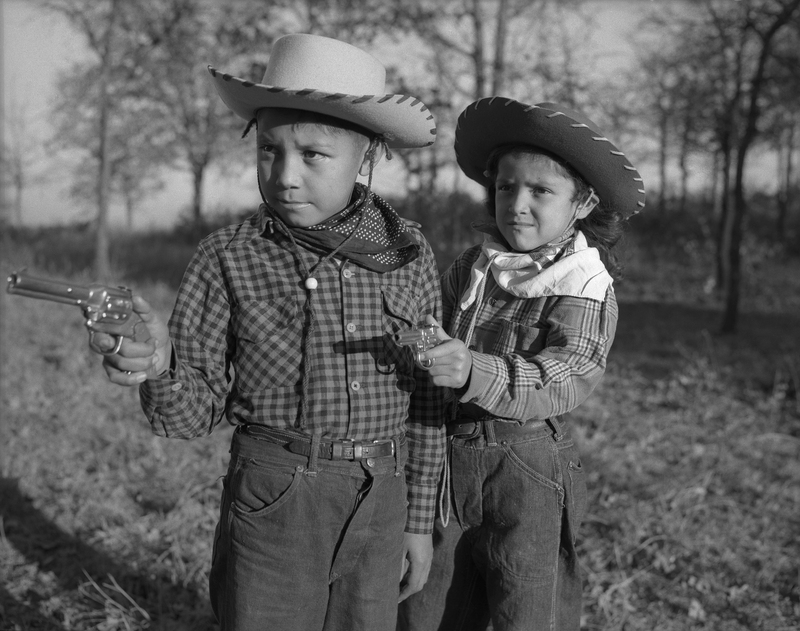 Poolaw photographed his Oklahoma community for about five decades in the mid-20th century. While he operated a bit as a professional photographer doing weddings and funerals and other big events his photographs are all effectively insider images. They’re both of his community and for consumption by that community alone. The community is one which most of us typically see only through the white gaze. The photos aren’t actively dealing with self-representation issues. They document and are an archive of people who society tends to ignore. We rarely get to see Indians as regular people. This allows and encourages society to think of them as no longer existing in today’s world. A lot of this caused by the way that the concept of “authenticity” is linked with Indian regalia and appearances. Being Indian is either a very specific physical stereotype of dark skin and sharp features or it’s a costume which can be appropriated by anyone. It’s weird and unexpected to see Indian clothing mixed with western clothing or settings. So seeing Indians dressed in regalia while driving or posing by modern cars just like any other mid-century American would pose is striking. The same goes with seeing soldiers wearing war bonnets with their military uniforms. Poolaw’s photos though are full of this kind of thing and we get used to seeing the mixing and matching. 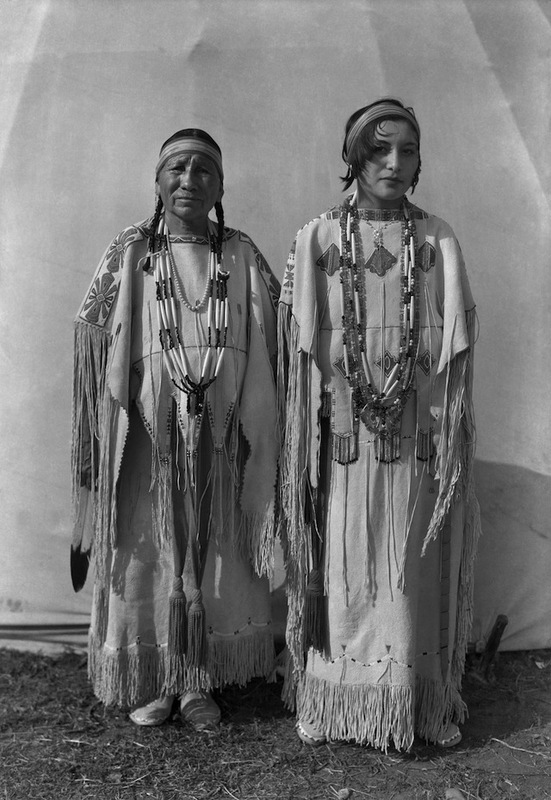 Even in what seems to be a straight photograph of two women in their regalia standing in front of a teepee we notice how the younger one has a modern haircut and makeup. All too often museums present Indian culture* as a stagnant craft which exists outside of the influence of other cultures. In Poolaw’s photos we see how his culture is changing over the decades, especially with how opening up the Kiowa reservation to non-Kiowa settlers resulted in a ulture where everyone is blending their heritages together. There are different Indian Nations intermarrying. There’s the whole Indians serving in the US Armed Forces and celebrating homecomings and departures with traditional ceremonies. It’s a lot of fun to see and is a necessary reminder of how all of cultures are living and growing things. *Or any non-white culture really. Historically, the photos are also very interesting because they cover the time from the Indian Citizenship Act to the Indian Civil Rights Act. This is a time period in which Indian Nations gain both more autonomy for themselves to eventually practice their religions and traditions as well as more rights within the United States as US citizens with protected rights. 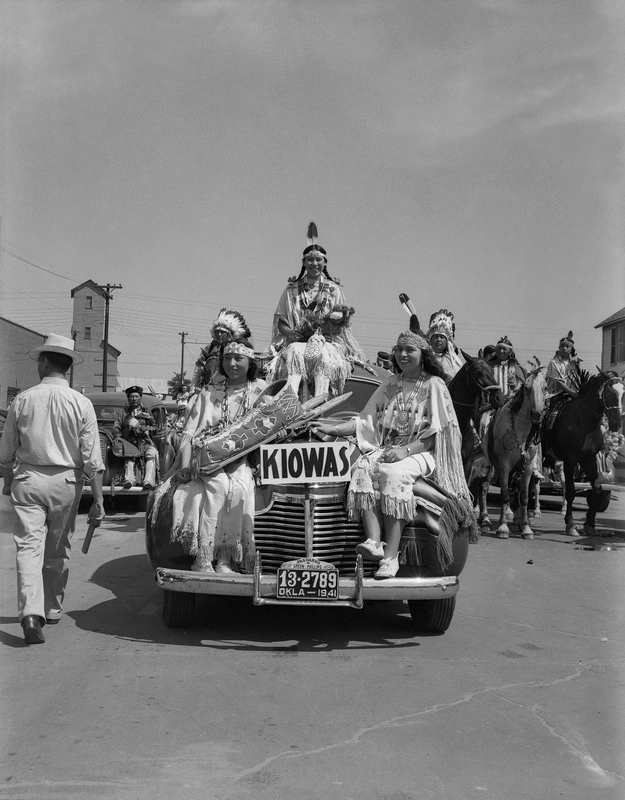 Poolaw specifically covers the development of Indian autonomy with his photos of the events which eventually developed into the what we now know of as American Indian Pow Wows. These photos work as a celebration of being Indian, archive of how the growth of acceptance of celebrating that by general American culture, and an uneasy critique of how the growing acceptance of powwow events has also lead them to be commodities. *As someone who attends and photographs these events these photos also serve as a warning to me about how I should respect the space and the participants. While it’s good that these cultural events no longer have to be practiced in a small private setting, the big events risk taking them from being for the participants and centering the audience instead. Poolaw, by being both an Indian and a photographer is able to straddle those worlds. This originally posted on NJWV. In the American West, the open road is one of those enduring, unavoidable photographic tropes. While Dorothea Lange and Robert Frank are the iconic images, I’ve always seen the photos as part of the larger theme of photographing technological expansion into the West. So photos of train construction like those by Russell* are also part of the same narrative. It’s a seductive image which captures much of the myth of The West. A technology’s-eye view full of possibilities. Places to go. Things to build. Landscape to tame. The freedom to become whatever you want to be. *My post on Russell’s Great West Illustrated covers more of this but Carleton Watkins has some train photos too. It’s also worth looking at Marc Ruwedel’s Westward the Course of Empire here, in particular photos like this one. I suspect that everyone in The West takes at least one photo of the big sky, unending road, and undeveloped landscapes stretching as far as the eye can see. I know I have. That Richard Misrach’s Border Cantos is able to reference and draw on this trope while conveying the exact opposite idea is my favorite part of his show in San José. In his images we have all the myths of The West except that everything is literally turned on its side. Instead of traveling along the road and into the frame, we know that the migration direction is side to side across the frame. On foot. The road is no longer an invitation, it’s a barrier. The landscape is no longer wide-open, it’s partitioned. This west is now explicitly about preventing travel. And it’s about traveling despite the barriers. The wall and border cuts through without regard for the terrain or landscape—whether natural or manmade. It’s a straight line on the map which creates an artificial imposition on real life. * It slices through mountains and deserts with gaps which are large enough to allow animals but not humans or automobiles to cross. ** It divides cities—we see photos of the wall crossing streets, parks, backyards, and farmland—into two with the singular purpose of keeping people, and only people, stuck on one side. It’s a visual demonstration of the absurdity of borders and what it means to say that “the border crossed us.” The land predates the border. Cities and settlements predate the border. Mexican people and their migrations predate the border. *I prefer the concept of geography-based borders but those, as the case of Chamizal shows, can be at least as absurd due to the fact that natural features change over time. **The wall itself also reminds me of Christo and Jeane Claude’s Running Fence except that where the Running Fence used the landscape, the border wall is imposed upon it. The wall is indeed absurd. Just looking at it reveals how futile the idea of making it impenetrable is. There are gaps. There have to be gaps. Sometimes the gaps are wider than the segments of wall. The frontage road gets dragged daily so that footprints show up. Migrants wear carpet over their shoes to hide their footprints. The territory it covers is so immense that the task of securing it is sisyphean. There’s no way to do it. To claim otherwise is irresponsible. It’s a bit of a shame that there’s no equivalent photographic trope regarding fences in The West. While the myth and appeal of The West is the promise of possibility, one enduring aspect has been the struggle over land usage. * Fences have been at the heart of that for over a century. Where the fence-cutting wars signified the beginning of the end of the open range and the increased conflict between Anglo and Mexican-American conceptions of land-use, the border fence is the newest incarnation of that conflict. *Granted, much of the history of photography in The West is the tradition of unspoiled landscapes and we have people like Robert Adams to thank for yanking us into The New West and reminding us that unspoiled landscapes are only a small part of the land usage equation. What a lot of the land-use discussion misses though is that it’s not just about how we’re using the land, it’s about who gets to use it. Which brings us to the other part of the exhibition. It’s not just about photos of the border. It’s about the migrants, the things they drop, and the small marks which they leave on the land. This part reminds me of Marc Ruwedel but there’s room here for multiple artists. The border may be the most-visible voice in this series, but the traces that the migrants leave are just as important. The border acts upon the landscape and the migrants. What the migrants leave behind is more passive, but still speaks to their will about making the crossing and how while they want to use the land for the same mythical hopes and dreams that The West has always promised, their very presence is in conflict with the way Anglos want to use the land now. The artifacts—clothing, books, trash, etc.—are all things that simultaneously speak to where the migrants come from and where they’re going. After he photographed them, Misrach sent them to Guillermo Galindo as part of a companion project to the photographs. Galindo’s project transforms the artifacts into musical instruments which, in-concert with the photographs, gives them life by providing them a voice. There are short videos featuring many of the instruments on bordercantos.com but listening to the full composition in the gallery is a completely different experience. I was struck by how close converting the artifacts to instruments cam to merely being a gimmick. But it’s not. It’s wonderful. The music is totally gente both in terms of its sense of sound/musical memory as well as how well it embraces the ethos that everything can be repurposed. It also works wonderfully as an aural context for all of the photographs. The border and The West has a long history of humans leaving their mark as they pass through. Photography is a way to capture these traces visually. Music and sound engages another sense and takes the entire exhibition to another level. While I was in California for the summer, I had a chance to stick my head into a small exhibition of Willard Worden’s photographs. The show is especially interesting from a documentary point of view since many of the photos show San Francisco both immediately before and immediately after the 1906 earthquake. I particularly enjoyed the photographs of the original Chinatown. One of the weird things about San Francisco is how, despite being a relatively old settlement in American terms, it has reinvented and rebuilt itself over and over again. Sometimes these reinventions and rebuilding are true boomtown cycles. Other times they’re by acts of god. But where Los Angeles seems to be about layering and papering over and appropriating its past, San Francisco doesn’t seem to care. Which is why it’s wonderful to see photos that show what things were like right before they were destroyed. * The old San Francisco, and Chinatown, photos show a city that I don’t recognize at all today. *On this note, I should have grabbed a copy of Janet Delaney’s South of Market from the gift store. But I needed to travel light since I was already all packed to travel back to New Jersey. Worden is also a master of night photography—taking advantage of wet streets and any available-light he could find. This is most evident in his photos of the Panama-Pacific Exposition grounds. Even as low-contrast prints they’re incredibly dramatic. In many ways offering a closing chapter on the earthquake since the expo was intended to demonstrate San Francisco’s rebirth, these photos also fall into the same category of depicting things that have been destroyed and paved over. The Exposition grounds were temporary and only the Palace of Fine Arts remains—and even that had to be torn down and completely rebuilt in order to do so. What I ended up thinking about the most in this exhibition though is the idea of photographs as consumable objects. Worden was a working photographer who wanted to sell prints. Lots of them. In whatever size you wanted. This exhibition includes portfolios and pricebooks for selling prints as well as information about which images sold well—though even with so much documentation, I still approached the photos as I do most photographs—looking at the technique and appreciating/critiquing the image. The colorized photos on the other hand forced me out of that approach and into one where I had to think of the image as an object—how it was intended to be used, by whom, how it was manufactured, etc. I didn’t like the colorized photos—heck, I dislike colorized photos in general—but I loved seeing them here. Worden worked at a time when photography wasn’t considered high art so his market was the middle class who couldn’t afford proper painting. The colorization operation reminded me a little of Thomas Kinkade in how precisely craftsmen had to work on the photograph to make it more paintinglike and acceptable as an object. Though the Kinkade comparison is a bit cruel of a comparison to Worden,* it’s refreshing to see these objects in a museum displayed as both art and as consumer artifacts—where they can prompt us to think about what kinds of “art” we’re willing to display in our homes and how we judge what other people choose to display. *Most of Worden’s work is honest about being photography rather than trying to emulate a different medium. Fine art photos are high brow now. Being reminded of a time when they weren’t reminds us of how high brow taste changes just like any other fashion. Museums tend not to mention this side of things. Art is typically treated as art for art’s sake—even if the museum is showing an exhibition of a specific collector’s holdings. We don’t think about the market and who’s allowed to dictate what’s “good” enough to be allowed into a museum. And museums don’t like us thinking about who they’ve excluded and why.